An info graphic (information graphic) is a representation of information in a graphic format designed to make the data easily understandable at a glance. People use info graphics to quickly communicate a message, to simplify the presentation of large amounts of data, to see data patterns and relationships, and to monitor changes in variables over time. Info graphics are being used more and more frequently to help people understand the information contained in that data. Info graphics are the combination of text and images to create maximum impact. There are two core activities to infographic success. Style is subjective but a good designer will know from experience what works. Chunk it down so you are capturing the main points. It needs to be hierarchical and digestible. Less is sometimes more. Optimizing for size means considering the number of pixels and also the size of the file .You don’t want the info graphic to take a long time to download. In terms of length you don’t want it too long. Try creating an info graphic that is 1,500 to 2,000 pixels in length. If you want to create impact about growth and have lots of stats then info graphics are perfect for that. Make sure they are factual and reliable, current and helpful. Make your info graphic easy to share. Provide an embed code. You also need to make sure it gets shared by letting influencers and your fans on social networks know about the “awesome” new info graphic that you have just created. Success is not set and forgets. Copyright is the legal concept that works—art, writing, images, music, and more belongs to the people who create them. According to copyright law, any original content you create and record in a lasting form is your own intellectual property. This means other people can’t legally copy your work and pretend it’s their own. They can’t make money from the things you create either. You can still cite and refer to other sources (including copyrighted materials) in your work. But to use, copy, or change a copyrighted work, you need permission from the person who holds the copyright. This permission is called a license. Make sure you attribute and let your audience know where you got the facts and figures from. Credibility is an important factor for a successful Info graphic. 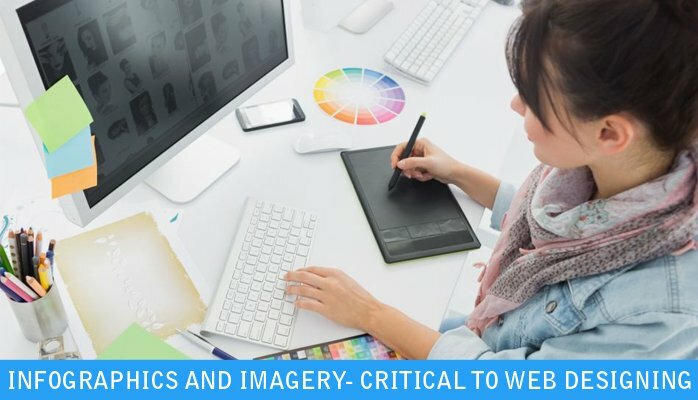 Images are a critical part of your website design in some areas. In other areas, they are definitely less important. At the highest level, images help your visitors connect and feel comfortable on your site. If 65% of the population describes themselves as visual learners, then you have to plan for people who want to look at pictures instead of reading words when you tackle a website design. Select images that have a strong relationship with brand goals. Remember, the purpose of your site is not just to showcase images Instead, the images you select should showcase the purpose of your site. Info graphics and Images are the main visual hook for websites that appears in logos, backgrounds, sliders and many more. They draw users into reading the text, illustrate the information provided in articles and blog posts and sometimes just entertain.